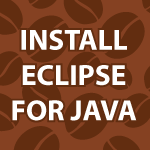 I’ve been asked to show you how to Install Eclipse for Java a few times lately. So in this video I’ll show you how to install Eclipse step-by-step. Not only will I show you how to install eclipse, but I’ll also cover how to install Java, set up code completion and install java libraries. If you prefer to read these steps look here Install Java 1.7 Eclipse (For Mac and PC) and How to Install Java Libraries. WHATS the difference of those ? when should i use which one ? please help. I am attempting to install this on my MAC and I get an error on attempting to run the file in Eclipse. Also it is work noting that if I run it via terminal it compiles and runs just fine. I am just attempting to run a very basic hello world program. Either you don’t have JAVA_HOME/bin in your PATH or you downloaded the JRE instead of the JDK. Check the directory where you installed Java and see if your /bin directory has javac.exe in it. If you don’t have a /bin, download the JDK and install it. Hi Derek, thanks for all you are doing. how am i going to use the library(apache commons library) you imported to eclipse in our code. and how does it help? I have tried many times to install Eclipse Indigo on my Windows 8 laptop but it just will not run. Microsoft says it is an incompatible program. What else can I do to write and execute Java code? Thanks! I was able to install NetBeans with no problems. Will your code work with NetBeans IDE? I am facing some problems post installing Android developer tools. The pop up comes when eclipse restarts and pop up says “Location of the Android SDK has not been setup in the preferences”. Moreover when I click on Android -> new Application project, it throws an error pop up saying ” The tools need to be updated via the SDK Manager” .. please help why is it so. I tried to google this, and the pop up is exactly same as in following link. tutorial “install android Development tools”. I faced this error while following steps in the tutorial. Sorry I couldn’t get back to you quicker. I’m guessing from your other post that you fixed everything though. I’m glad you fixed it. I was successfully able to resolve all errors. Those were because of some wrong steps that i took while installing eclipse. I am a newbie in android development and your videos are a kickstart for me ! Superbly explained and they are concise and to the point. Hi, Great I’m very happy that I could help. You’re very welcome. Connection timed out: connect”. Please derek, what do i do? Replace https with just http for the URL. I have an updated way of installing eclipse kepler here. this error pops up as well “org.eclipse.equinox.p2.core.ProvisionException. eclipse failed to load the jni shared library jvm.dll ??? Went to oracle to run JDK 7 x64 as indicated in your video. It halts and returns message ~not a valid win32 prog. I’m on Windows 7 which I believe to be an x64 OS. Seen this before ? Is there a solution ? They’re bragging about JDK 8 now. Should I ‘upgrade’? Thanks for the excellent work you put into your very informative videos ! It sounds like a Windows error. Here are a ton of solutions to try. As per Java 8, I won’t upgrade. I’m actually still using Java 6 for most things. Just my opinion. Check out part 26 of this series. i cover installing the newest tools there. I have the latest Macbook Pro with Yosemite and i cannot run Eclipse. Any solutions?